THE CONNERS: It’s a bit odd to watch this show, because I never watched the original series. 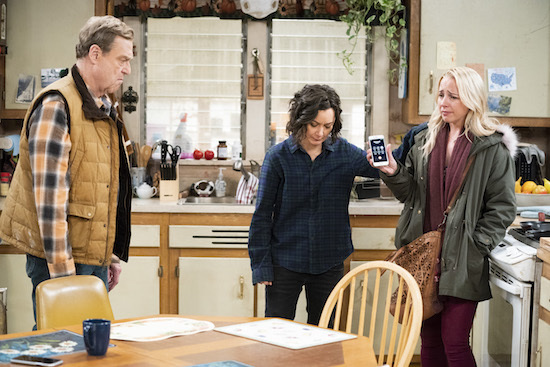 It felt like a lot of the finale hinged on nostalgia for ROSEANNE: the Lunch Box, David/Darlene. The David and Darlene thing made a little sense to me—and I’m curious what things will be like in the as-not-yet-ordered next season, when Johnny Galecki isn’t a series regular on a different series. The Emilio twist was…brutal. This family has been through a lot. THE FLASH: It was lovely to see Iris so protective over Nora; it’s a shame her daughter is hiding vital things from her family. SPLITTING UP TOGETHER: Oh my God, a child named Rabbit, and its pet rabbit named Pamela Katherine. Also, Lena befriending a social media influencer made me miss SELFIE so much. Uh, and we should all be afraid of these kids. THE ROOKIE: I’m not sure how realistic this was to how cities handle what happens when a high-profile figure comes to visit, but if it’s even 10% truthful, there’s a lot more behind-the-scenes drama going on than I would have expected. Having to set up traffic roadblocks, of course. Having to investigate potential threats day-of? That’s a lot. I’m happy Nolan got the door jam of his family home. It’s still strange to think about how much of his former life he just up and left to start this new job, but it’s nice he didn’t lose that important memento.